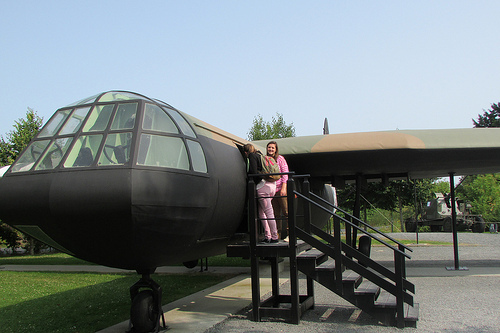 For students attending The National WWII Museum’s Normandy Academy and Summer Residential Program, the “classroom” included Omaha Beach, Ste Mere Eglise, Jackson Barracks and the NASA Michoud Assembly Facility. Lessons in leadership and decision making ran throughout the programs, leaving a lasting impression on the students. The Normandy Academy began in New Orleans on June 21. Fifteen students from across the country arrived at the Museum after weeks of preparation by reading works from top WWII scholars and viewing oral histories from the Digital Collections of The National WWII Museum. At the Museum, the students examined all of factors facing General Dwight D. Eisenhower as he struggled with the decision to go on June 6, 1944. They also looked deeply into the issues surrounding the individual soldiers. Through a special tour, they were able to go inside a Sherman Tank and feel the cramped conditions firsthand. The most powerful Museum experience by far, was a conversation with Tom Blakey, a veteran of the 82nd Airborne Division who jumped into Normandy in the early morning hours on D-Day. Once in France, the students set about their roles—debating strategic, moral and logistical decisions made in the Normandy campaign. 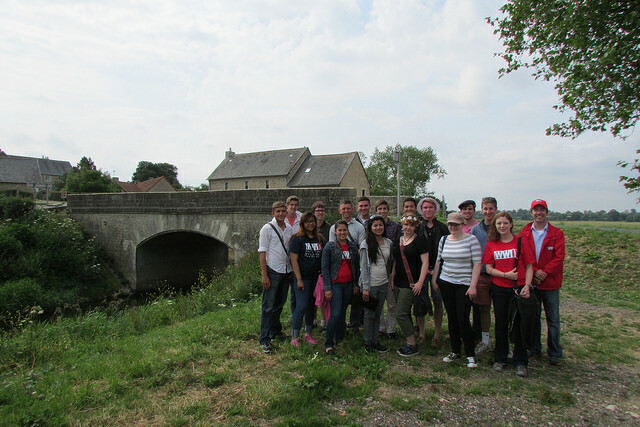 The first stop was Pegasus Bridge where two students presented opposing views on whether several bridges could be effectively taken by paratroopers and held against German counterattacks until reinforcements arrived. After 20 minutes of presentation, the students concluded that it was the best course of action to take the bridges as the possibility of leaving infantry units stranded on the beaches could be disastrous. Debates like this continued at each stop, including a superb debate over the merits of adding Utah Beach to the invasion plans. For adding the beach, the students argued that having infantry closer to the port of Cherbourg would speed the capture of a critical deep water port. Against the plans, students commented that the Germans would likely destroy the port before the Americans could capture it and that the distance between the two American landing beaches would be too great. Ultimately they decided the risks were worth it and that Utah should be added to the plans. While in France, students also took advantage of the many patisseries, cultural sites and a special light show on the Tree of Liberty near the Bayeux Cathedral. The Summer Residential Program examined critical leadership decisions that spanned the entire war. Students spent one week at the Museum with two special excursion days that expanded their understanding of leadership in WWII. Students began with an examination of the Arsenal of Democracy in the US Freedom Pavilion: The Boeing Center, followed by a discussion of how to best mobilize America’s workers and involve women in the war effort. After a closer examination of propaganda on the Home Front, the students debated how to handle John Abbot, a conscientious objector who refused any task that could aid the war effort in any way. In the European Theater, students debated issues surrounding the invasion of Normandy, Operation Market Garden and Anzio. In the Pacific Theater, a discussion of whether General Jonathan Wainwright should surrender his forces on Corregidor showed how well versed in military protocol the students had become through their preparation and museum visits. An additional four stops were valuable to the experience. At the Chalmette Battlefield, the students saw and heard about British supply line issues in the Battle of New Orleans—an important detail that students kept in the back of their minds while discussing WWII battles. At Jackson Barracks, the headquarters of the Louisiana National Guard, students saw and heard how military tactics changed after WWII with new technology and strategy. Two other stops would seem to have less to do with WWII but offered experiences that tied directly in to the program. A swamp tour near Pearl River allowed students to experience being on a flat-bottomed boat and see terrain that would prove unfamiliar to most Americans. 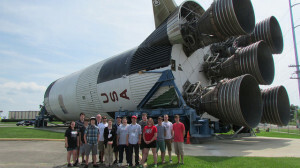 A tour of the NASA Michoud Assembly Facility gave the students insight into large scale production processes of the kind that were taking place all across the United States to build war material for the military. After an exhilarating and informative week, the students ended with a quick tour of the French Quarter and a celebratory final dinner. For more information on Summer Leadership opportunities for high school and college students, visit WWII Museum Tours or call 504-528-1944, ext. 257. The Invasion of Normandy from the National Archives. The best way to learn about historical events is to actually visit the sites where those events took place. As the Director of the Museum’s Travel Programs, I can speak with some authority on this. My years here at The National WWII Museum have taken me from London, to the beaches of Normandy, through Belgium and Luxembourg, into Germany and Austria, along the French Riviera and the “boot” of Italy, and even through the Philippine Islands. But my very first visit to Normandy, on our 2005 Victory in Europe Tour, is the one that always stand out the most. I had studied D-Day for 10 years, watching all of the movies and documentaries; reading the best books on the subject; listening to the stories of the WWII veterans who were actually there, but I learned more in one minute of standing on the bluffs overlooking Omaha Beach than in the previous 10 years combined. Perspective. This was a word that kept floating in my head during the tour and after when people asked me what I learned on the trip. No matter how much you have analyzed and studied photos and maps, only being on the ground can bring these sites to life. The only word I could come up with was perspective. I saw D-Day through the perspective of the men storming ashore and the near-impossible task that lay ahead of them. Most importantly though was the perspective from the German side of the beaches. Positioned atop the bluff, just outside of the Normandy American Cemetery grounds, one can imagine what it would have been like for the soldier manning the defensive positions awaiting the armada to unload its human cargo. Easy. That was another word I kept coming back to. How “easy” it must have been for the defenders to unleash their own private hell on the GIs who made it off of their Higgins Boat. Though I have returned to Normandy every year since that tour in 2005, I still am overcome by a wave of pride, sorrow and wonderment at what the American soldiers faced, suffered and achieved on that June day. And I am still amazed at how much more there is for me to learn about D-Day. 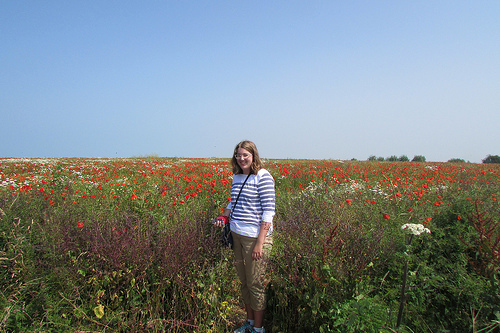 Over the years, the National WWII Museum has brought guests over to Normandy and has developed wonderful connections with locals. These connections have flourished into friendships with tour guides, various museums, and individual civilians who provide our tours with wonderful assistance and access. Blog by Jeremy Collins, Director of Travel & Conference Services at the National WWII Museum. The 2014 Normandy Academy will take high school and college students from the pages of history to the beaches and battlefields of Normandy. 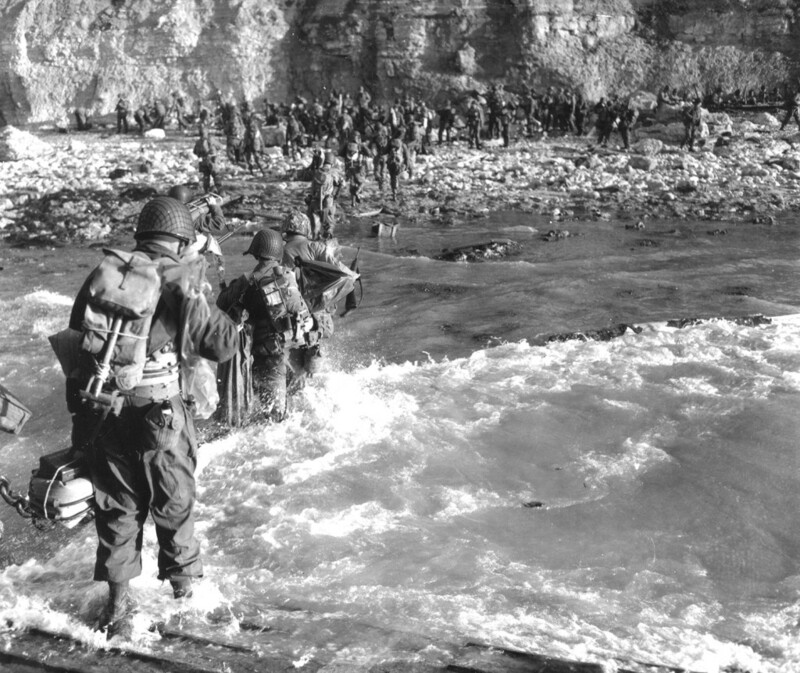 Students will take an 8 week online course through Nicholls State University that will prepare them to think critically about the causes, events and outcomes of D-Day. Following the course, students will arrive at the Museum to examine documents and artifacts relating to the invasion and its aftermath. Finally, students will spend six days in Normandy following in the footsteps of the soldiers, viewing monuments and museums and interacting with locals. The first full day of touring will take the students to the eastern flank of the invasion. The day begins with a tour of Pegasus Bridge, the first Allied objective captured on D-Day. In the early morning hours of June 6, 1944, Horsa Gliders under the command of Major John Howard of the British 6th Airborne Division landed in fields only several yards from the bridge. The operation went so smoothly that the element of surprise meant that there was very little German opposition. Howard’s men would repel a small counterattack later that morning, and reinforcements arrived to ensure that the Germans could not retake or destroy the bridge. 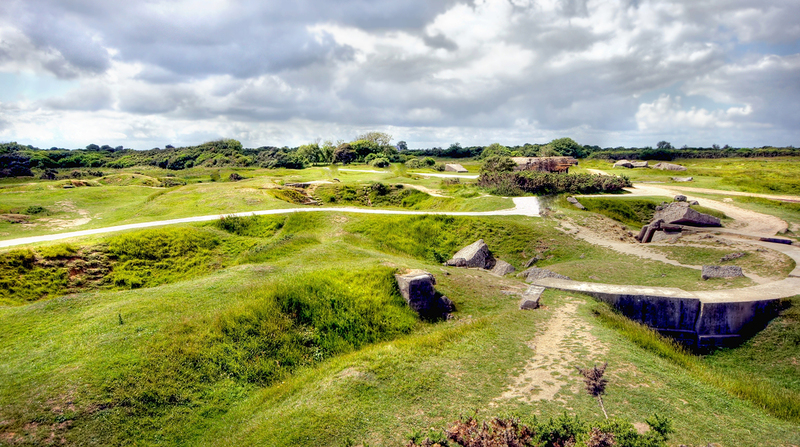 The next stop is the Grand Bunker Museum in Ouistreham. The museum is itself an artifact as it was the Fire Control Tower for the area around Sword Beach. The tight spaces inside the bunker reveal the dangerous combat that awaited soldiers as they stormed the beaches in the morning hours. From the observation room, students can look out over the English Channel through a stereoscopic range finder. After a picnic lunch in Arromanches and a view of the remains of Mulberry “B,” students will view the film Normandy’s 100 Days in the Arromanches 360° Circular Cinema. Featuring archival footage on nine high definition screens that surrounds each viewer, quotes from military leaders in several languages narrate the action. The last site visited is the remnants of a German artillery battery at Longues sur Mer. This is the only German battery in Normandy with the 152 mm guns still in place. This battery engaged in a long duel with British ships on June 6, as the last intact gun continued firing well into the evening. Adjacent to the guns, a field of poppies may be seen depending upon the spring weather in Normandy. After a bus ride back to the hotel, dinner will be enjoyed in small groups at local restaurants. Registration for the 2014 Normandy Academy is ongoing. To register or receive more information, call 1-877-813-3329, ext. 514 or visit us here.